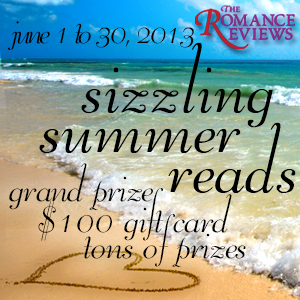 The Summer Sizzling Reads Party has begun! The Summer Sizzling Reads Party has begun! Only it’s more of a *carnival*! Oh man, you have to go check this out–the contests, the puzzles, the prizes–THE STORIES! I’m already finding far too many stories I want to read and I’m just going to have to play the games in hopes of snagging some! For me, June is blackberry bushes snow-white with blossoms, and the smell of honeysuckle in the air. Early morning walks with the dog in the cool mountain air. Lazing with a book on the sandy beach at the lake. Everyone curled up with a book on the porch chairs during the long twilight hour. My Q&A goes up tomorrow–so be sure to stop back by here to get the answer if you don’t already know it–but if you’ve read The Boys of Summer, you will! Do come join the party–it will be a wonderful way to kick off your summer reading! This entry was posted in Uncategorized and tagged announcements, contests, Sarah Madison, Summer Sizzling Reads, The Boys of Summer by Sarah Madison. Bookmark the permalink.